"Yea, he magnified himself even to the prince of the host, and by him the daily sacrifice was taken away, and the place of his sanctuary was cast down. And an host was given him against the daily sacrifice by reason of transgression, and it cast down the truth to the ground; and it practised, and prospered. Then I heard one saint speaking, and another saint said unto that certain saint which spake, How long shall be the vision concerning the daily sacrifice, and the transgression of desolation, to give both the sanctuary and the host to be trodden under foot? And he said unto me, Unto two thousand and three hundred days; then shall the sanctuary be cleansed." – Daniel 8:11-14. To say, "Daily Sacrifice," would be somewhat like the colloquialism, "two twins." Only one word in each case is necessary – the meaning is obvious. "Twins" means "two." 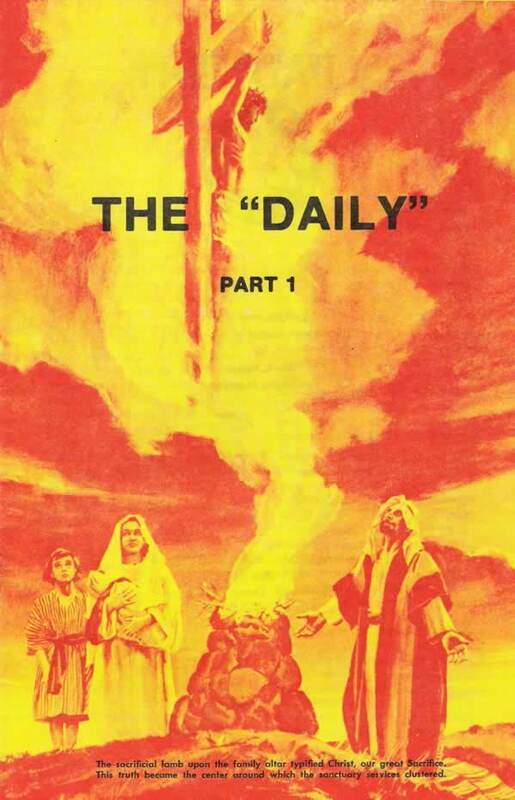 "Daily" includes two sacrifices, morning and evening, and the rendering is continual, endless. and as the drink offering thereof, thou shalt offer it, a sacrifice made by fire, of a sweet savour unto the Lord." – Numbers 28:2-4, 6, 8. In the antitype, Christ fulfilled the Sanctuary law of both the morning and the evening sacrifice. He was nailed to the cross at the third hour, 9 o'clock (Num. 28:4). "And when they had crucified him, they parted his garments, casting lots upon them, what every man should take. And it was the third hour, and they crucified him." Mark 15:24,25. He died at the ninth hour, 3 o'clock (Num. 28:8). "And at the ninth hour Jesus cried with a loud voice, saying, Eloi, Eloi, lama sabachthani? which is, being interpreted, My God, my God, why hast thou forsaken me? And some of them that stood by, when they heard it, said, Behold, he called Elias. And one ran and filled a sponge full of vinegar, and put it on a reed, and gave him to drink, saying, Let alone; let us see whether Elias will come to take him down. And Jesus cried with a loud voice, and gave up the ghost. And the veil of the temple was rent in twain from the top to the bottom." – Mark 15:34-38. He arose in time, early the first day of the week, to present the wavesheaf at the third hour (9 o'clock in the morning) in the Heavenly Sanctuary; then, returned to earth the same morning with those who ascended with Him, and labored forty days to gather the 120 who received the outpouring of the Spirit on the very day of Pentecost: "For these are not drunken, as ye suppose, seeing it is but the third hour of the day." – Acts 2:15.
ceremonial offerings were not nailed to the cross, but were observed by Jesus and the disciples after the crucifixion. These facts help us to see that the ceremonial law was not nailed to the cross: only the sacrifice, the Lamb of God, was nailed to the cross to meet the demands of the law. "Broadly speaking, the law of Moses consists of three parts. The first is the Ceremonial law, the law of the temple – the sacrificial law. This law, of course, we today must not observe, except in antitype..." – Timely Greetings, Vol. 2, No. 37, pp. 14, 15. The Seventh-day Sabbath is a "Daily" in that it consists of a morning and evening sacrifice (Num. 28:9, 10). According to Leviticus 23:3, it is the first feast mentioned. The same is true of each of the special sabbaths enumerated in the chapter, each of which has its special offering, besides the continual, morning and evening sacrifice, the "Daily." "Not only the sanctuary itself, but the ministration of the priests, was to 'serve unto the example and shadow of heavenly things.' Hebrews 8:5. Thus it was of great importance; and the Lord, through Moses, gave the most definite and explicit instruction concerning every point of this typical service. The ministration of the sanctuary consisted of two divisions, a daily and a yearly service. The daily service was performed at the altar of burnt offering in the court of the tabernacle and in the holy place; while the yearly service was in the most holy." – Patriarchs and Prophets, p. 351. "The daily service consisted of the morning and evening burnt offering, the offering of sweet incense on the golden altar, and the special offerings for individual sins. And there were also offerings for sabbaths, new moons, and special feasts." Ibid., p. 352. "Morning and evening the heavenly universe behold every household that prays, and the angel with the incense, representing the blood of the atonement, finds access to God." – Manuscript 15, 1897. See S.D.A. Bible Commentary, Vol. 7, 971. "True reverence for God is inspired by a sense of His infinite greatness and a realization of His presence. With this sense of the Unseen, every heart should be deeply impressed. The hour and place of prayer are sacred, because God is there." Prophets and Kings, pp. 48,49. "Abraham, 'the friend of God,' set us a worthy example. His was a life of prayer. Wherever he pitched his tent, close beside it was set up his altar, calling all within his encampment to the morning and evening sacrifice." – Patriarchs and Prophets, p. 128. "The most important part of the daily ministration was the service performed in behalf of individuals... Such was the work that went on day by day throughout the year. The sins of Israel being thus transferred to the sanctuary..." Ibid., pp. 354, 355. We have need of a daily, yes, hourly (morning, 9 o'clock and evening, 3 o'clock) mediation for sin and uncleanness, much the more as the day approaches when wickedness and uncleanness are on every side do we, as believers, need the "bread of the presence" ever near "before the face of the Lord" for us (Patriarchs and Prophets, p. 354). "Moses made the earthly sanctuary, 'according to the fashion that he had seen.' Paul declares that 'the tabernacle and all the vessels of the ministry,' when completed, were 'the patterns of things in the heavens.' Acts 7:44; Hebrews 9:21, 23. And John says that he saw the sanctuary in heaven. That sanctuary, in which Jesus ministers in our behalf, is the great original, of which the sanctuary built by Moses was a copy." Ibid., p. 357.
earthly structure could represent its vastness and its glory. Yet important truths concerning the heavenly sanctuary and the great work there carried forward for man's redemption were to be taught by the earthly sanctuary and its services." Ibid., p. 357. "And what was done in type in the ministration of the earthly sanctuary is done in reality in the ministration of the heavenly sanctuary." The Great Controversy, p. 420. "As anciently the sins of the people were by faith placed upon the sin offering and through its blood transferred, in figure, to the earthly sanctuary, so in the new covenant the sins of the repentant are by faith placed upon Christ and transferred, in fact, to the heavenly sanctuary." Ibid., p. 421. "And as the typical cleansing of the earthly was accomplished by the removal of the sins by which it had been polluted, so the actual cleansing of the heavenly is to be accomplished by the removal, or blotting out, of the sins which are there recorded. But before this can be accomplished, there must be an examination of the books of record to determine who, through repentance of sin and by faith in Christ, are entitled to the benefits of His atonement. The cleansing of the sanctuary therefore involves a work of investigation – a work of judgment. This work must be performed prior to the coming of Christ to redeem His people; for when He comes, His reward is with Him to give to every man according to his works. Revelation 22:12." Ibid., pp. 421,422. "It was seen, also, that while the sin offering pointed to Christ as a sacrifice, and the high priest represented Christ as a mediator, the scapegoat typified Satan, the author of sin..." Ibid., p. 422. "Christ was the foundation of the Jewish economy. The whole system of types and symbols was a compacted prophecy of the gospel, a presentation in which were bound up the promises of redemption." The Acts of the Apostles, p. 14. "After His ascension, our Saviour was to begin His work as our High Priest. Says Paul, 'Christ is not entered into the holy places made with hands, which are the figures of the true; but into heaven itself, now to appear in the presence of God for us' Hebrews 9:24. As Christ's ministration was to consist of two great divisions, each occupying a period of time and having a distinctive place in the heavenly sanctuary, so the typical ministration consisted of two divisions, the daily and the yearly service, and to each a department of the tabernacle was devoted." Patriarchs and Prophets, p. 357. "As Christ at His ascension appeared in the presence of God to plead His blood in behalf of penitent believers, so the priest in the daily ministration sprinkled the blood of sacrifice in the holy place in the sinner's behalf." Ibid., p. 357. "Thus in the ministration of the tabernacle, and of the temple that afterward took its place, the people were taught each day the great truths relative to Christ's death and ministration..." Ibid., p. 358.
is today teaching the "Daily" ministration of His blood in the Sanctuary above and is calling all Israel to the daily worship hour, 9 and 3, that each may be prepared to stand in the great and dreadful day in which Elijah commands all to, "Remember ye the law of Moses, my servant... with the statutes and judgments. Behold, I will send you Elijah the prophet before the coming of the great and dreadful day of the Lord." Malachi 4:4,5. "The Lord thy God will raise up unto thee a Prophet from the midst of thee, of thy brethren, like unto me; unto him ye shall hearken .... And it shall come to pass, that whosoever will not hearken unto my words which he shall speak in my name, I will require it of him." Deut. 18:15,19. "And it came to pass at the time of the offering of the evening sacrifice, that Elijah the prophet came near, and said, Lord God of Abraham, Isaac, and of Israel, let it be known this day that thou art God in Israel, and that I am thy servant, and that I have done all these things at thy word." 1 Kings 18:36. Elijah's work is to restore a system of true worship. 'Elijah' another prophet "like" Moses, teaches the same commandments, statutes and judgments for modern Israel. Likewise in our day, on New Mt. Carmel, we are in the time of the purification of the Church, the Investigative Judgment of the Living; therefore, we are commanded to observe the "Daily," morning and evening sacrifice. This is the seventh round, and those who desire to stand on Mt. Zion with the Lamb, live forever, never to see death; will be found observing His ordinances, laws, and statutes, including the morning and evening sacred hours of worship, at 9 A.M. and 3 P.M., as restored by the Elijah of today, when Christ our High Priest offers His blood in behalf of all repentant sinners. They will be one of the 144,000 and a part of God's great army to the whole world in this generation. Remember: "That as the Elijah of Christ's first advent was one person, and also as the Elijah of Mt. Carmel of old was one person, not a multitude of priests, then by parity of reasoning the Elijah of today must also be one person, not a multitude of ministers." General Conference Special, 1954 Reprint, p. 32.